Mono-White Soldiers has been on everyone’s radar since the spotlight was shined on it at SCG Worcester. 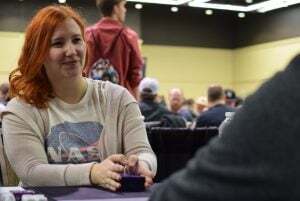 With Grand Prix Seattle (and Mox Boarding House’s sold-out Duel for Duals!) less than a month away, it’s been on my mind more than most. I’ve been putting Captain of the Watch into play off the back of Preeminent Captain since last June, where I narrowly missed making Day Two with a Soldier Stompy deck at Grand Prix Vegas. Since then, I believe the deck has undergone quite a bit of tuning, and it might just be primed to break into Legacy’s mainstream. Soldier Stompy is a deck that has been built around one surprisingly un-soldiery card: Suppression Field. A turn one Suppression Field can shut down many of the format’s top decks, turning off fetchlands and making opposing Deathrite Shamans into little more than one-mana 1/2’s. However, the card requires a very specific shell, one with few permanents with activated abilities. That means cards like Aether Vial and Umezawa’s Jitte are completely off-limits. The other non-soldier “prison” piece that you are happy to run is Chalice of the Void. 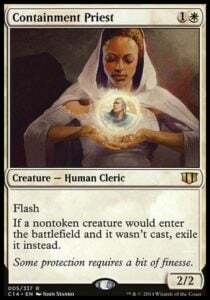 In a format as blisteringly fast as Legacy, a Chalice on one can turn off most (if not all) of your opponent’s deck. This also means that you don’t play any one drops, and having no activated abilities and no one-mana spells can make your pool of potential win conditions very…unique. Two of the other “prison” pieces that find their home in Soldiers are both named Thalia. Thalia, Guardian of Thraben slows your opponents down by providing another tax effect against your opponents’ non-creature threats and answers. Thalia, Heretic Cathar keeps your opponents slow by making all of their non-basic lands enter the battlefield tapped (yes, even their fetchlands!) and forcing their creatures to wait a turn before they get to blocking. Palace Jailer also helps you complete the “prison” motif (get it?) by exiling any creatures that find themselves in your way and giving you a powerful card draw engine through the Monarch mechanic. Why will your opponents’ creatures need to be blocking? In addition to some of the best prison cards in the format, you also have the ability to apply incredible pressure with your army of white creatures. An early Preeminent Captain attacking to put a Daru Warchief (or even better, a Captain of the Watch) into play can cut down opposing life totals very quickly. Recruiter of the Guard gives you the ability to tutor for almost any threat (unfortunately for us, Captain of the Watch is a 3/3), and Enlistment Officer is often the perfect top-deck to rebuild your hand and board after a board wipe. Aerial Responder is the most recent addition to the deck, taking a spot that used to belong to Ballyrush Banneret, and is a concession to the popularity of Delver decks, giving you the ability to deal with their Delver while gaining back some life in the process. In addition to your bevvy of two-mana-producing lands (that’s four Ancient Tomb and two City of Traitors), you also run a full suite of Chrome Mox, which enables you to make the crucial turn one Suppression Field and Thalia plays that are necessary in slowing down opposing game plans. Cavern of Souls is an obvious inclusion (just name Soldiers!) that lets you get around pesky counter magic. Karakas can help blank removal aimed at Thalia while also helping shore up your Sneak and Show and Reanimator match-ups – though it is important to note that this can get expensive with Suppression Field on the board, as it’s the only activated ability in your deck. Shawn admits that his sideboard isn’t particularly well tuned, but the cards have two things in common: answering any threats that aren’t answered with main-deck cards, and protecting your own board. You have graveyard hate cards like Faerie Macabre and Rest in Peace, additional taxing effects such as Damping Matrix and Ethersworn Canonist, and answers to linear strategies in cards like Containment Priest, Phyrexian Revoker and Cast Out. Cast Out is a newer addition to the deck as a catch-all answer to opposing hate cards (a single Ensnaring Bridge can do wonders against you). Legacy Soldier Stompy is a fun choice for people who enjoy pointing to the many permanents they have on the battlefield and watching their opponents frown. As far as Legacy goes, it is a cheaper option that is relatively straightforward to pilot, making it a great choice for any aspiring Legacy player. As for me? I just like turning lots of creatures sideways while my opponent is stuck with four fetchlands on the board. Hopefully that gameplan works well for me in Seattle!